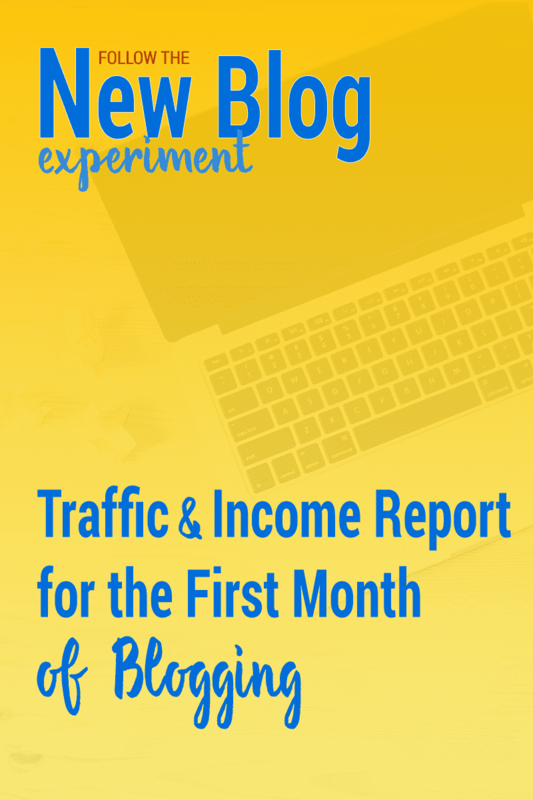 Traffic and Income Report for the First Month of Blogging. Time is flying by like CRAZY. Not only do I have a one month old baby now, but the New Blog launched over a month ago. It’s time to share its stats and details from the first month! The New Blog launched on August 10th, 2015. This post is documenting the blog from August 1oth – September 10th. I decided to give the author of the New Blog an alias name in order to make it easier for me to talk about her and her blog. From here on out I will refer to her as Jane and I will still refer to her blog as the New Blog. A glance at being live for the first month. Currently, Jane is posting 3 times a week on her blog. When she’s not creating new content for the blog, she’s busy promoting and networking! She’s quickly found that blogging is a lot of work. Participated in Facebook support threads. She joined Facebook groups relating to her niche as pays attention to the discussions going on there. When people ask for suggestions or have questions relating to her content, she sends a reply and links to her own site. Retweet other blogger’s in her niche. As you’ll soon see in the traffic section of this post, the New Blog is already getting search traffic for terms relating to her main categories. Before Jane launched her blog, we made sure to setup a sitemap and submitted it to Google. This makes it easier for Google to find your awesome content. Go get yours set up and submitted too! She’s also doing a great job including meta titles and descriptions to all of her posts and alt tags on her images. Jane was nominated for the infamous Liebster award. We both decided that it would be best not to participate in the Liebster award. What is the Liebster award? Liebster Award is given by bloggers to other bloggers. Usually it is targeted towards bloggers who have less than 200 followers. The award works like a chain letter (did anyone else participate in sticker chain letters with their friends as a kid? or just me? I LOVED them.) and once you receive the award you have to nominate other bloggers for the award. In addition to nominating other bloggers, you are supposed to write a post about the award and post a Q&A about you and your blog. Its supposed to be a way to get to know other bloggers and get more traffic. 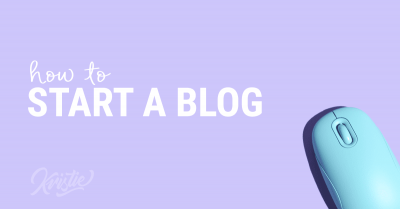 It sounds like a good idea since the purpose is to help you connect with other bloggers. However, we decided that it wasn’t in the best interest of the New Blog to participate though. Why? First, you’re telling people you’re a small or newer blog. We’ve worked so hard to have Jane’s blog seem like a pro blog from the start. Why would we want to crush that by participating in the Liebster award? Second, Jane felt it was important to only publish quality content on her blog that fit the within her focus. I think it was a good decision and don’t feel like she missed out on anything. Now for the part you’ve all been waiting for, the numbers. Followers report after blogging for one month. Right now the New Blog peaks when there are new posts and drops down on days there isn’t new content. This is perfectly normal. 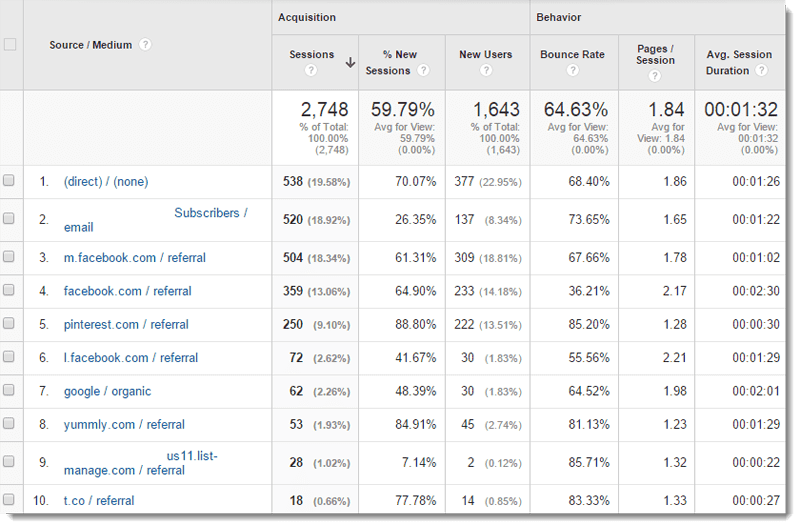 I wish Google Analytics would group the Facebook referrals together, because Facebook currently takes up 3 of the 10 referrals. I’m very happy with where her main referrals are coming from though. Proof that Facebook isn’t dead and that having an email list is important. Even though Jane’s list isn’t very big yet, it still accounts for 18.92% of her traffic. Can’t wait to see how that changes as we focus on her list this month. Logo – $40. Jane had an Etsy designer come up with a logo for her. It turned out great. We added the logo to her blog and used the icon portion of her logo to create a favicon and to add a custom gravatar to commenters who do not have a gravatar of their own. It’s great branding. The logo was added to the blog shortly after Jane published her first articles. No income to report yet, but hopefully soon! Set up a few banner ads and include affiliate links in some posts and start making the big bucks. Write a round up post featuring other bloggers. Create a freebie for newsletter subscribers and get more subscribers. Link to previous posts to encourage more interaction on the blog. Become a Yummly publisher. As a food blogger, this could really help boost her traffic. Takeaways to apply to your blog. Be weary of follow threads. I mentioned that the New Blog participated in support threads in Facebook groups. These are a great way to spread your content and build a community around your blog. However, I would like to throw some caution out there about participating in follow or like threads. I am always hesitant to participate in follow me and I’ll follow you on social media platforms. Why? You’ll most likely you end up with a whole bunch of followers that never actually interact with you. This is especially a big problem with Facebook’s algorithms. When you have a low percentage of people that respond to your post – Facebook will start showing your posts less in the news feed. Also, brands and companies will pay attention to more than just the number of followers you have. They want to see if your followers interact and engage with you. You want real followers. Quantity is great, but think quality as well. Join groups related to your niche. I’m not talking about blogging groups, but Facebook groups or forums that relate to the topics you write about. Jane is able to send people to her blog when someone else posts questions relating to her articles. Added Bonus: If you don’t have a post relating to the discussions going on in these groups, you can use the questions as ideas for upcoming posts on your blog. Don’t wait until everything’s perfect to start. You probably noticed that the New Blog launched without her logo. A lot of people will tell you it’s super important to have your branding in place before you get started. Here’s the thing though, nothing will ever be perfectly how you want it. So just start. You can perfect things as you go along. What do you think of the New Blog’s first month of blogging? What lessons will you apply to your own blog? I started my blog less than a month ago, so this is super helpful in terms both blogging tips, and comparing where my own numbers are at. Congratulations on the new blog! Good luck, let me know if you have any questions. Congratulations and awesome first month! I’m rounding out my 4th week and just broke over 1k in views, and just a few subscribers as well. That’s awesome, Elaine! Congratulations. We’ve tracked the new blog for an entire year. You can check out the last post, if you’d like! Sounds pretty normal. Networking makes it so that you’re not the only one sharing your stuff. Give it a try! Wow that’s an impressive first month! My page views for the first month of FrugalAsianFinance.com were similar to yours, but I didn’t and still don’t have as many subscribers and followers on social media. Great job! That s great that your first-month page views were similar. Work on converting those views to followers/subscribers. In your sidebar subscribe, maybe tell people why they should subscribe. How does subscribing benefit them? Also, I couldn’t find links to any of your social media accounts to follow you. Maybe add them somewhere? Lol oh well hello Ms. FAF, nice seeing you here! Kristie these stats look awesome! Thanks for sharing!! You’re welcome! Hope you are able to get your own insights on how to grow your blog. Congrats on the newly minted blog Jennifer. There is no way to have that kind of traffic the first month. Even if you know what you’re doing, if you don’t spend money you have no traffic, your site is too new to have organic traffic from google. Even targeting a really good keywords your blog isn’t good enough, too new. What would you estimate would be the average amount of traffic in the first month? And what do you think the growth rate goal should be? You’re welcome! Good luck with your blog launch. Thanks for documenting the new blog experiment. Hi Hannah! Thank you so much for leaving a comment. I like hearing from people that have read my posts. I’m also glad that the series has helped you know what to expect and make plans of things you should do with your own site. Do keep me posted on how things go! Good God Kristie, you doing an amazing job in my life right. I came across your blog just this morning and I have answers to almost all my questions. I want to start a fashion blog in Nigeria and I intend to make money from it, I know nothing about blogging but with you, there’s hope. I’m looking forward to chatting with you about my needs and maybe troubles. thanks a bundle Kristie. Atuba, I am so happy you found my blog and that the articles were able to answer your questions. Please, let me know if you have any questions. Best of luck to you! Thank you for sharing your inspiring journey! Congratulations on the site views and following. My blog is few days older than yours and for now I can only dream of such numbers. I still need to learn a lot but take it one step at a time. This is amazing. Please keep doing these posts, it’s so intriguing to watch from this side of things to see how quickly a new blog is able to progress with some help. I’m just about my launch my own blog on December 1st and have been doing a TON of prep work such as growing an audience base and reading everything I can get my hands on about how to succeed as a blogger (I was a blogger previously, but was never serious about it eventually becoming my full-time career until now). Thank you so much for doing this series! So informative and interesting. I can’t wait to read more! Hi Miranda, so glad you’ve stopped by and explored my blog today. How exciting that your new blog is going live so soon. I have posted the second month of blogging already, and will be doing a third month update soon! Let me know if you have any questions for me. I’m just about to embark on setting up a brand new blog to help equine business owners grow their businesses, so I’m absolutely loving the ‘New Blog’ series! It’s so helpful and I’ve bookmarked all of the posts so that I can go through with a fine-tooth comb and follow all of your advice when I have more time. I plan to launch Jan 2016, so I’ll come back and let you know how I get on! That sounds like an awesome new business venture for your Sophie. Can’t wait to read the blog. Good luck with the launch. Let me know if there is anything you need help with or you would like to see us try. Great post! Like you pieces of advice very much! How much time did it take to learn all this stuff? I’ve been blogging on WordPress since 2010. So, 5 years and counting? Interesting post! Very nice! Screenshots help to understand everything better! Thanks for sharing! Loved this post! It sounds like Jane is doing the same things I am as a blogger who’s been at it for two years! I need to pick up my game! I’ll be reading more of your site for sure! Do you do coaching? Is that how you’re helping ‘Jane’? But, I will be sharing most of the coaching I give to Jane through upcoming posts. Through these traffic reports and additional posts. This is amazing and so helpful. I just created a new Blog project after retiring my old one. I’m excited to continue to learn from your insights! Thank you Jardana! I’m excited for your new blog, I’m sure you’re going to be very successful helping people. Isn’t it neat that Jane’s been so successful so soon? It’s definitely a lot of work, but worth it. Hi Jordan! Sharing other blogger’s content and interacting with them on their social platforms is one of the biggest contributing factors to her social growth. Hope that helps! You can also read this post for more details on the strategies she implemented to kick start her following before her first post published. Wow. So this new blog went live around the same day I began promoting my blog (which I had been working on behind the scenes for about a month, so the similar timeline is pretty amazing!). I need this advice!! Thanks for doing this series! That is so cool that you guys launched around the same time, you’ll have to share your progress with us too! What do you like about blogging so far? What have been the most effective ways you have found to share mediumsizedfamily.com? This is amazing. I often wonder how popular bloggers got started. What their first post was to how they built a following. This case study was a brilliant idea of yours. Truly unique. I will definitely be keeping up with The New Blog updates to find out. And i wish Jane the best with her blog. I am super curious as to what it is because her focus is something I am into personally. But I’msure II’ll come across her soon if she continues doing well. I’m so glad you like the case study! It was an idea I had brewing for a while, so it’s been fun to see it come together and to watch Jane GO! Love this project and thanks for sharing my link up list! No, THANK YOU. You’re link up list is such a great resource! Hopefully the techniques we use help build your blog too! Even though I’m not a new blogger, this is an invaluable way to see exactly how a blog grows. Thank you for this project, I look forward to following! I’m glad that this project is valuable for experienced bloggers too! 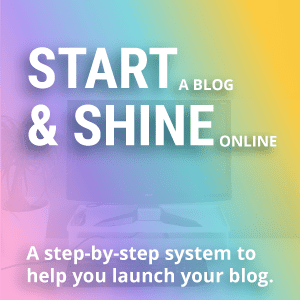 I’m Kristie, your start a blog guru. Think of a name for your blog. Make your blog look good. 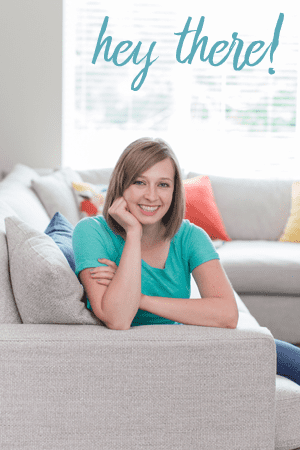 You don’t have to miss a thing though because I have a free six-day course + Start a Blog Checklist just for you! The New Blog Course will ensure you have everything in place for your new blog. Plus you’ll get my niche guide and start a blog checklist. After the course, you’ll also get regular emails from me to help you build + grow your blog business. Get the Start Checklist and Course!